Some say his teeth glow in the dark, and that if you tune your radio to 88.4 FM you can actually hear his thoughts. All we know is, he’s called The Stig. 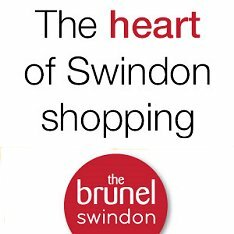 And he's coming to Swindon. 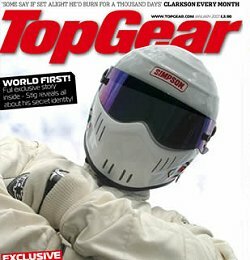 Perry McCarthy, the self-confessed 'comedian in a racing driver's body', who played the Stig in series one and two of BBC's Top Gear, will be making a guest appearance at a sporting dinner here on 19 July 2008. For someone who never used to speak on the show or remove his helmet, and just drive cars incredibly fast, Perry - a former Formula One driver - should have quite a tale to tell of his exploits with Jeremy Clarkson and co.
That, and driving some of the world's most exotic supercars at breakneck speeds. And throttling the most out of a 'reasonably priced car' round a race track. He may even be able to give an idea who the present 'Stig' is - the identity of which has been shrouded in mystery since Perry gave up the role in 2003.
Who ever it is - and some say Damon Hill has made a number of appearances as the white-helmeted anonymous racer in recent years - he last burned rubber in Swindon in 2007. The Stig turning up at the Science Museum Swindon to film a race between himself and fellow Top Gear presenter Richard Hammond - with remote-controlled cars! 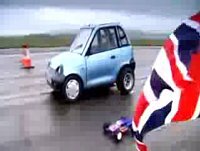 The Stig behind the controls of a specially adapted G-Whiz model which took on Hammond's real-size remote-controlled car in a duel around the runaway of the former RAF base in Wroughton. 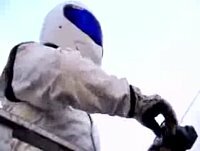 The Stig left stunned at the finish as Hammond manouevred his mini-motor underneath the wheels of the G-Wiz - and blew it up! The quite hilarious video of which is available to view below. Quite when the real Stig will return, who knows. A date surely as mysterious as the man himself. Tickets for the sporting dinner in which Perry McCarthy will be speaking are still available - tickets cost £42.50 each or £400 for a table of 10. Proceeds go to the Callum Kaye fund. Full details are available via the OTT link below.